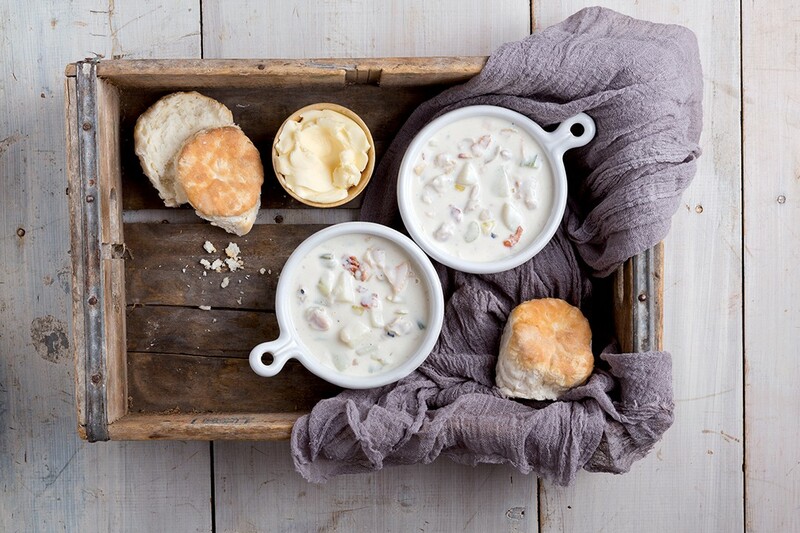 The Bluegrass State might be known for its bracing bourbons, but there’s something entirely different here that can warm you down to your toes just as easily. (Well, almost.) Rich, warm, and smothered in the creamiest Mornay sauce, the Kentucky Hot Brown is the stuff of dreams come wintertime. Way back in the 1920’s, The Brown Hotel in Louisville opened its luxurious doors. Some of the city’s most elite and wealthiest members frequented the hotel for ballroom dancing and drinks. Late into the night—when the band took a break—hundreds of guests would descend on the hotel’s restaurant for a snack. So in 1926, Chef Fred Schmidt whipped up something new: a hot, open-faced turkey sandwich reminiscent of Welsh rarebit, only better. After the usual ham and eggs the guests were used to eating for a late-night snack, it was a delightful change that grew in popularity and demand. Today, the iconic hotel still serves the Kentucky Hot Brown sandwich, along with establishments across the entire state. So what’s all the clamor about? Picture this: Texas toast topped with roasted turkey and Roma tomatoes, covered in a cheesy white Mornay sauce and broiled until bubbling. Then it gets a few final slices of crispy bacon, some parsley, and a dusting of paprika. 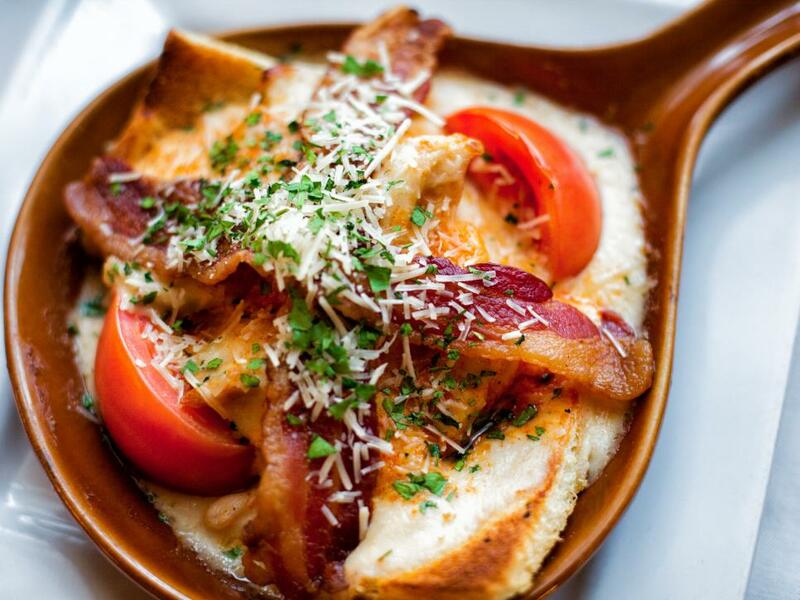 It’s no wonder the Hot Brown earned a reputation as one of the most sought-after comfort foods in Kentucky. 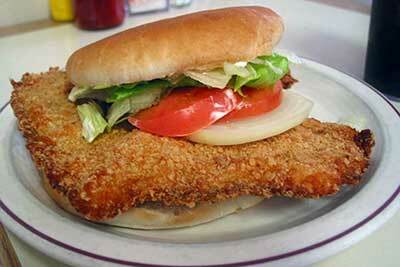 In fact, it’s garnered attention nationwide over the years. Everything from The L.A. Times and The Wall Street Journal to the Food Network and Travel Channel have covered the legendary sandwich. Naturally, a few variations cropped up in restaurants and home kitchens (Hot Brown casserole, anyone?) But ultimately, it’s pretty tough to improve upon the original masterpiece created nearly a century ago. Visitors, of course, want to experience the true home of the Hot Brown. That’s why all year long—but particularly during the Kentucky Derby—The Brown Hotel remains the busiest and best place to dig in. In Lexington, Ramsey’s Diner is beloved for their generally authentic take with one small caveat: the cheese is added to the top instead of mixed into the sauce. And The Whistle Stop in Glendale is another beloved Hot Brown destination, with a touch of sliced ham tucked into the mix. Want a Hot Brown for breakfast? Head over to Wild Eggs in Louisville, where the “Kelsey KY Brown” is presented as the usual decadence, but with a crowning egg on top. The list of national parks has been growing for over 100 years now, pointing travelers to some of our country’s most beautiful and beloved destinations. 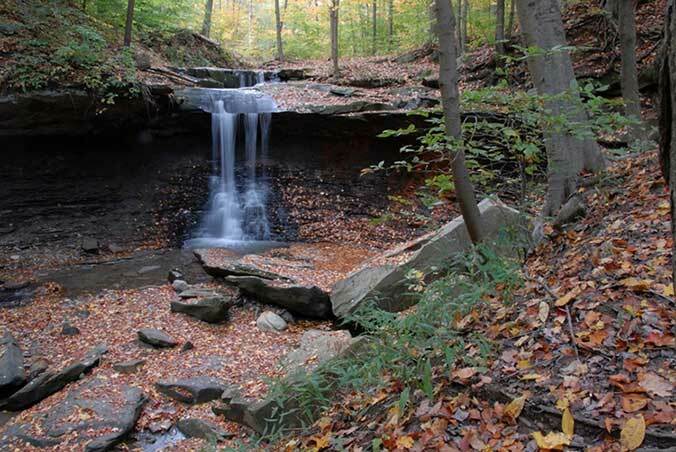 One of the newest additions is sandwiched between Cleveland and Akron: Cuyahoga Valley. Designated a national park not too long ago (October 2000), the area draws more than 2 million visitors a year for hiking, off-road biking, bird-watching, camping, kayaking and even golfing.The park is open 365 days a year and the entrance fee is hard to beat (completely free). Below, we’ve pulled together a few highlights to help you plan your trip to Cuyahoga Valley. Every season brings a different look to the park and a different activity to enjoy, so this really comes down to personal preference. Summer is popular, of course, and a great time to explore the waterfalls, wander the trails and do a little catch-and-release fishing in the Cuyahoga River. Don’t discount winter for a visit, though. When there’s more than 6 inches of snow on the ground, the park rents out winter sports equipment: think snowshoeing, cross-country skiing, sledding and ice fishing. But if you ask a local park ranger, we hear they favor autumn, when sweeping views of the valley are transformed with color. Here, it’s a beautiful mix of farmland, forest, river, waterfalls, and rock formations, so there’s no shortage of scenery to behold. Most visitors set off for the hiking trails: the Buckeye Trail is long-distance, occasionally muddy (it crosses several streams) and carries you out to more isolated areas of the park; Ledges Trail offers a 2.2 mile easy hike and an overlook with picture-perfect views across the valley. One of the most popular hikes is the Brandywine Gorge Trail that leads to a stunning waterfall–easily a visitor favorite. To spot wildlife, head to Beaver Marsh, where you might encounter a great blue heron, wood ducks, otters, and yes, likely beavers. There’s a boardwalk across the marsh, making it easy to venture near the water and all the creatures who love to call it home. Paddlers can canoe and kayak down the Cuyahoga River for a different way to take in the landscape. Worth noting: the park recommends this only for experienced paddlers, as they don’t actively clear hazards from the river and warn that conditions can fluctuate. For an in-depth look at the valley, book a seat on the train. The Cuyahoga Valley Scenic Railroad offers 3.5 hour excursions all year long, giving you great glimpses of all the natural splendor during the journey. Some of the rides even offer beer and wine tastings, murder mysteries, and fun kids’ themes (Polar Express!). If you plan to stay overnight, the park has primitive camping for $25 through the end of October (nearby state parks also have campsites) plus two beautifully historic lodging options: The Inn at Brandywine Falls and the nine-bedroom Stanford House. For those who want to hike, run, or bike long distances along the Ohio and Erie Canal Towpath Trail but don’t want to make the return journey, you can hop on the train one-way (bike aboard) for just $5. The proper way to flag down the engineer is by waving both (not one!) arms overhead at any of the boarding stations. And finally, a word to golfers: there are four golf courses within the park. So if hiking and biking aren’t your thing, plan to visit Cuyahoga Valley and tee it up instead. Summer is prime season for National Park adventurers, for all the obvious reasons. But Acadia puts on her most spectacular show in the fall. Most savvy travelers agree: September and October are your best months for heading to the crown jewel of the North Atlantic coast. With miles of craggy coastline set against a backdrop of mountains and thick forests, it really does resemble the perfect autumn postcard. For several weeks starting around mid-September, “leaf peeping” season is alive and well, transforming the landscape into fiery hues of reds, oranges and yellows. Plus, daytime temperatures are just right for a brisk hike along one of the many winding trails the park is praised for. Cadillac Mountain is a must-do. It’s the highest elevation in the park with unbeatable views. You can hike up if you want a challenge (plan on 2 hours each way), but you’ll get the same reward at the top if you drive: stunning scenery. Most people make the journey at either sunrise or sunset, when the light glitters across the sea for a few golden moments. Go for an easy 3 mile hike around Jordon Pond, where visitors marvel at the deep, crystal clear water. Carved out by a glacier, the pond also offers great views of the famous “Bubbles,” two rounded mountains on the north end. And don’t forget to stop into Jordon Pond House for afternoon tea and fluffy popovers with local fruit jam. For a less touristy excursion, the Isle au Haut is far more remote than the busier Mount Desert Island. Mountain bikers and serious hikers can explore the dense woods, marshes, rocky cliffs, coves and wildlife that make up the island, accessed via ferry. If you’re a wildlife enthusiast, you’ll be in paradise here. Think whales, puffins, otters, moose, bears, and the list keeps going. Birdwatching is a big attraction, and you can book guided tours (bring binoculars!) for bird-centric hikes and a chance to spot Peregrine falcons or bald eagles swooping between the cliffs. Where to stay? 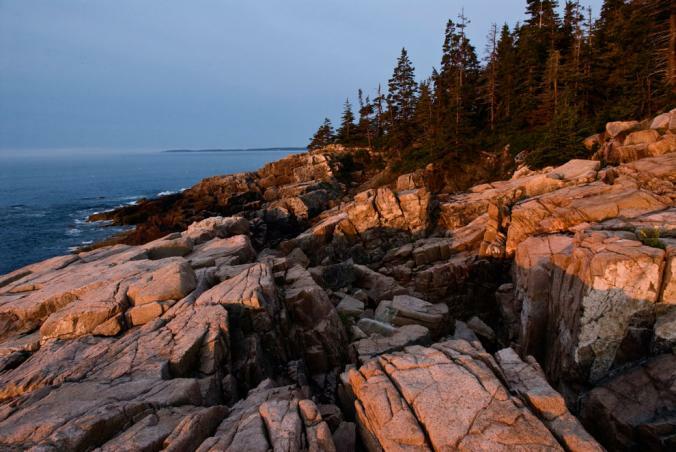 Camping is a great option in the summer, but for the fall there’s nothing like the historic coastal charm of Bar Harbor. If you visit in September, you can catch the Acadia Night Sky Festival. The town is serious about keeping away light pollution; in fact, Bar Harbor has an ordinance to use “night sky friendly” lighting on all outdoor construction to preserve their majestically starry nights. Hotels, adorable bed-and-breakfasts, and Airbnb options abound, keeping you close to the endless opportunities of Acadia. California may have earned a reputation for its breathtaking beaches and coastline, but travelers who venture into the state’s vast desert will be rewarded with a different version of beauty. A wild, mystical vibe permeates the landscape where the Mojave and Colorado Deserts collide just east of the Nevada border. Joshua Tree National Park spreads out across 800,000 arrid acres and attracts campers, climbers, hikers and stargazers all year long. So What Are Joshua Trees? They’re yuccas that grow as trees with clusters of spiky leaves. The name is rumored to come from early settlers (not a U2 album) who saw a resemblance to the Biblical figure Joshua reaching his hands up in prayer. Massive numbers of these trees are scattered across the region, giving the national park its moniker. The better question is: why not? A 2.5 hour drive from Los Angeles, it’s a picturesque road trip into an ancient desert unlike any other. It’s the epitome of “getting away from it all,” as you’ll discover there’s no lodging or electricity or lights or cell reception. This is the California High Desert; unplug from society and embrace the adventure! The varied terrain is a giant playground waiting to be explored. There are several entrances to the park, but the main one is in the town of Joshua Tree (a music and artist’s community that’s a cool destination unto itself). Buy a day pass or an annual pass at the entrance, grab a map, make sure you have water, and hit the trails. There are several areas to park near major trailheads, and the scenic hikes are some of the most beloved in the country. Some notable points of interest: Intersection Rock, Arch Rock, Skull Rock, Hidden Valley, and Keys View, which provides sweeping views of the Coachella Valley. Don’t forget to look up. Throngs of visitors come to Joshua Tree to marvel at the night sky—a miraculous, glittering canvas above the desert landscape. The East side of the park is best for stargazing, as it’s the furthest from any city light pollution that might dim the spectacle. More than 300 campsites are scattered throughout the park and run $15/day, and remember: there’s no electricity or running water here. If you aren’t into tent camping, check out lodging or AirBnB’s in the town of Joshua Tree. There are literally thousands of climbing and bouldering routes, plus plenty of experienced guides to help you scale the huge rock formations and take in the desert sights. Portions of the park explode with wildflowers in February, March and April, so bring your camera to capture the blooms. 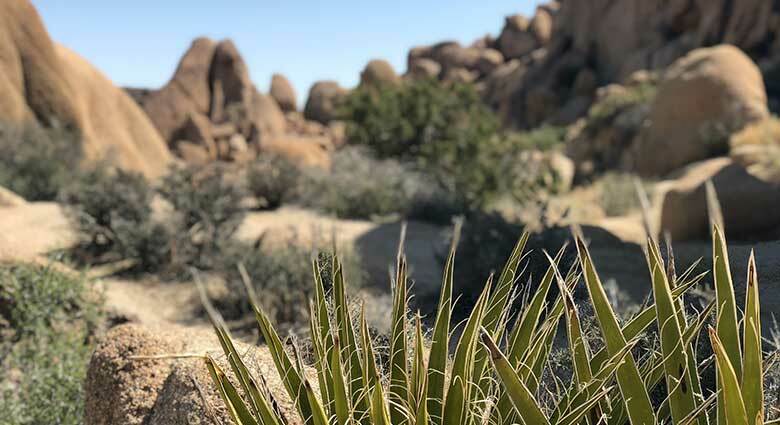 These months see a higher volume of visitors to Joshua Tree, not just for the flowers but for the great weather (the summer months can be especially hot). Grand, gloomy and peculiar—words chosen to describe the world’s longest cave system by an early explorer. His name was Stephen Bishop and his remains are buried on site at Mammoth Cave National Park, which pulls in 2 million curious visitors each year. Situated in southern Kentucky about halfway between Louisville and Nashville, the caverns twist and turn under the ground for 400 miles, and that’s just the mapped passageways. Explorers keep finding and charting their way deeper into the labyrinth and even more peculiar territory. The cave was created millions of years ago after ancient waters left behind a layer of limestone capped by sandstone and shale. Erosion and rainwater then created hollowing effects. The result is a stunning and complex system of “mammoth” underground chambers and rivers, dramatic natural formations, and jaw-dropping geological wonders. There’s really not a bad time to visit Mammoth Cave. No matter the season, temps hover around 60 degrees underground. That said, summer sees the lion’s share of visits. The downside: contending with larger crowds. Upside: access to seasonal campgrounds, higher frequency of tours and the option to explore the above-ground area of the park. Fortunately, there are several options for cave tours. Visitors can pick from an easy .25 mile sight-seeing stroll (the Frozen Niagara Tour) to the free-climbing, knee-crawling, 6 hour Wild Cave Tour. One tour weaves you through miles of underground trails by flickering lantern light; one takes you up a 280-step staircase to check out high natural domes. Tour fees range from $5-$55, some specifying age and occasionally physical fitness requirements. The Introduction to Caving Tour is popular with families. You’ll learn basic rules and techniques and gain some insight into the caving environment. If you want to capture great photos, the Frozen Niagara Photo Tour lets you weave through some of the more visually striking parts of the cave: Thanksgiving Hall, Rainbow Dome, Drapery Room and Onyx Colonnade. Mammoth Cave guides are filled with extensive, intriguing facts, so pay attention to their stories! You might pick up bits of knowledge on your visit. One such bit: during the War of 1812, slaves mined the cave for a mineral called saltpeter that was used to make gunpowder for the war. Another bit? Critters like the eyeless cave shrimp are found in the darkest depths, where there’s no use for vision. Park guides are also known to flip off the lights on certain tours, enveloping groups in an eerie blackness only a cave can accomplish. The cave temperature is described as “autumn weather” and it’s recommended you dress accordingly—a light jacket should do. Wear comfortable shoes that won’t skid, as you’ll likely do quite a bit of walking and portions of the cave can be wet or slippery. Despite the impressive 400 miles of charted underground territory, only 10 of those miles are available for the public to tour. 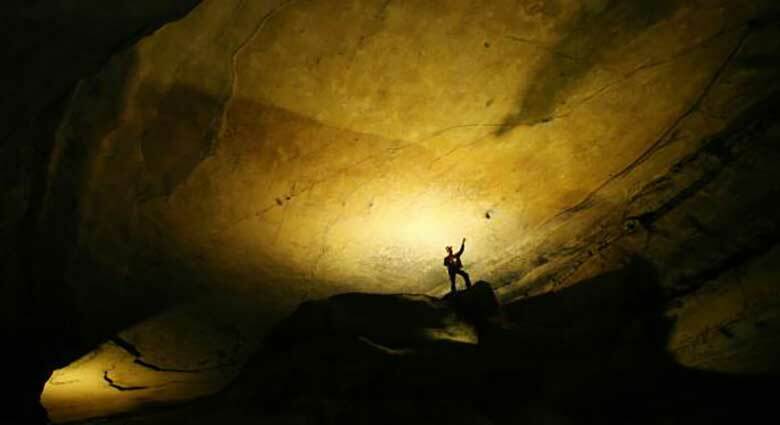 Don’t forget there are other attractions above the ground at Mammoth Cave National Park. You’ll find 70+ miles of outdoor trails for hiking or horseback riding and the Green River is open for fishing and canoeing. Mammoth Cave Campground is a quarter mile from the park’s Visitor’s Center, and if camping isn’t on the agenda, there’s also a hotel on site. The area surrounding the park showcases the beautiful, rolling hills southern Kentucky in known for, with several nearby small towns off I-65. Bowling Green is a half hour’s drive from Mammoth Cave and has plenty of restaurant and shopping options after a day of exploring. Iconic photos like this one clearly show how this national park got its name. From early evening and on into morning, fog often rolls into the valleys here, creating this unusual ‘smoking’ effect. Experiencing this for yourself is made easy by the many accessible and breathtaking views found throughout the area. 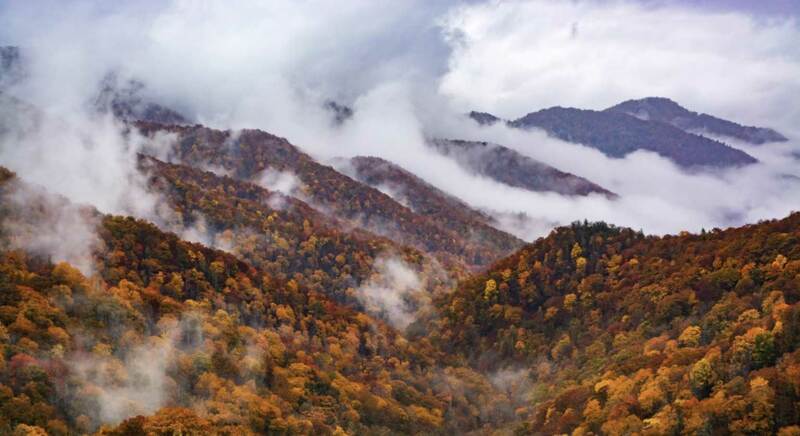 Nestled along the border between Tennessee and North Carolina, the 522,000 acres of Great Smoky Mountains National Park is frequently accessed from through Gatlinburg, Tennessee. Truly, any visit to this area needs to include a little time spent in the sister communities of Gatlinburg and Pigeon Forge, but don’t let either of their personalities cloud your opinion of the Smoky’s. In some ways, these two towns couldn’t be more different, but they have their similarities, too. Both offer a bevy of activities for a family looking for an interesting getaway, but Pigeon Forge leans toward the blatantly commercial (there are no less than 13 go-kart tracks on the main drive) while Gatlinburg is decidedly kitschy (think haunted houses, fun houses, treetop zip lines and the like). There are certainly some highlights to be found in both places – including Dolly Parton’s Dixie Stampede in Pigeon Forge and the tram at Ober Gatlinburg – but neither town compares to the astounding beauty and amazing sites of the park. If you have a few days to spend here, the first one should be in the car, as counter-intuitive as that might sound. Take the Roaring Fork Motor Nature Trail, a one-way loop of Cherokee Orchard Road, stopping along the way for a few short hikes to become familiar with the flora and fauna. There are some beautiful hikes off this main road to a variety of views: old grist mills, settlements, and two of the parks most popular waterfalls, Rainbow Falls and Grotto Falls. Last time we were there, we encountered black bears playing beneath the spray and both deer and elk are common. Spend your second day venturing deeper into the park. At Newfound Gap, you can straddle the line between the two states and see hikers traversing the Appalachian Trail. Farther in, a trip to the unique ramp up the viewpoint at Clingman’s Dome is a must-see. Or if you have a little more time, a short drive west from Gatlinburg will bring you to Cade’s Cove, an isolated and fertile valley that was once a hunting ground for the Cherokee Indians and home to some of the earliest settlers in the region. The 11-mile, one-way loop road encircles the Cades Cove valley and is one of the best places in the park to view wildlife. You’ll see 18th- and 19th-century cabins, three churches, and a working grist mill, as well as other historic outbuildings. This part of the park is generally considered the best chance to see deer, black bears, and wild turkeys. The range, towering above its surrounding region, has a high annual precipitation, including quite a bit of snow, which can cause unexpected road closures that make Smoky Mountain travel difficult. Spring, when all the snow has melted except on the mountain peaks and flowers are in full bloom, is the nicest time to travel to the Great Smoky Mountains. The fall is also a great time for a visit, when the leaves change and the colors are at their peak. Whenever you go, consider the park attracts more than 10 million visitors a year, so it can be crowded. She’s right: with nearly 250,000 acres of mixed-grass prairie and ancient fossil beds, Badlands National Park should be on the must-see list for every adventurer, especially fossil lovers. The park offers an amazingly diverse topography that was once home a collection of animals that is hard to imagine today: saber tooth cats, rhinos, camels, three-toed horses, and a large variety of sea life all once called this area home. In fact, the White River Badlands contain the largest known assemblage of mammal fossils from the late Eocene and Oligocene periods. The specimens found here have contributed significantly to the science of vertebrate paleontology since the first discovery by Dr. Hirma Prout in 1846. Significant finds continue in the park today. In fact, just a few years ago, a seven-year-old park visitor named Kylie found a fossil near the visitor’s center. When she reported it to the park rangers, their investigation identified her find as an exceptionally rare and well-preserved saber tooth cat fossil. Additional surveying turned up even more samples, and the area is now known as Saber Site. In addition to the bird, reptile, and mammalian fossils, there are marine fossils from an ancient sea that covered the region some 70 million years ago during the Cretaceous period. Samples found in the Pierre Shale and Fox Hills Formations include ammonites, nautiloids, fish, marine reptiles, and turtles. The spectacular fossils preserved within the White River Badlands have been studied extensively for more than 175 years and are featured prominently in museum collections throughout the world. The park also boasts a working Fossil Preparation Lab. Located in the Ben Reifel Visitor Center, this active paleontological laboratory gives visitors the chance to watch paleontologists at work and learn more about the continuing scientific discoveries. If fossils aren’t your thing, you might be interested in one of the many day hikes available through the park. Trails range from easy to strenuous, so there’s something for everyone. Two highlights include the view of the White River Valley from the top of the strenuous Notch Trail and the magnificent vista at the end of The Door Trail, an easy .75-mile hike the terminates through “the Door” – the appropriately named break in the 100-mile long wall that creates a natural barrier in the park. 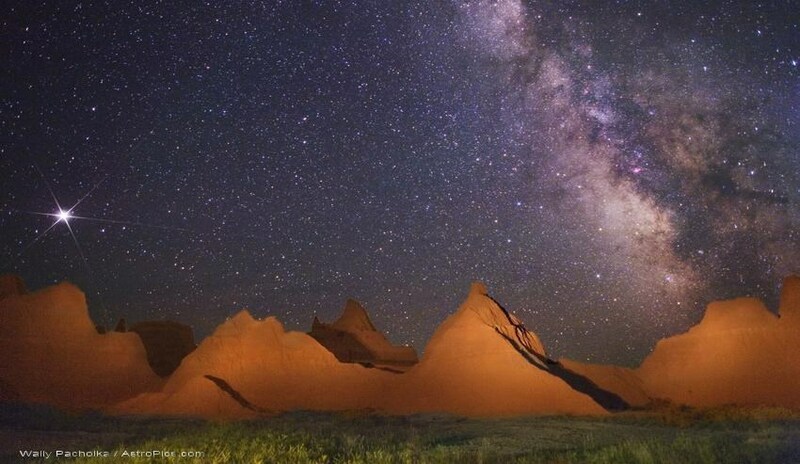 A final must-see: The night sky over Badlands National Park is simply stunning. Summer night sky viewing is offered at the Cedar Pass Campground Amphitheater on Friday – Monday nights. On any clear night, visitors you’ll see more than 7,500 stars, and views include not only galaxies but also star clusters, nebulae, planets, and moons. Look closely, and you’ll also see fly-overs by numerous satellites and the International Space Station. After the evening ranger program, stay to enjoy the spectacular night sky through telescopes provided thanks to funding from Celestron and Badlands Natural History Association. Getting there: The park is about 3 miles south of I-90 at S. Dak. 240, 75 miles east of Rapid City and 27 miles west of Kadoka. In many ways, getting there can be half the fun. Before heading out, be sure to spend a little time reviewing the fun and quirky roadside attractions found at Travel South Dakota. Always carry water! Rangers recommend two quarts per person per two-hour hike. A hat and sunglasses are strongly encouraged, as well as rain gear since weather conditions can change rapidly.